This has already led to the ridiculous situation in some English universities, of muslim students being questioned on their views because they have been seen reading (set) textbooks on global terrorism and security – despite this being the postgraduate course they are studying. 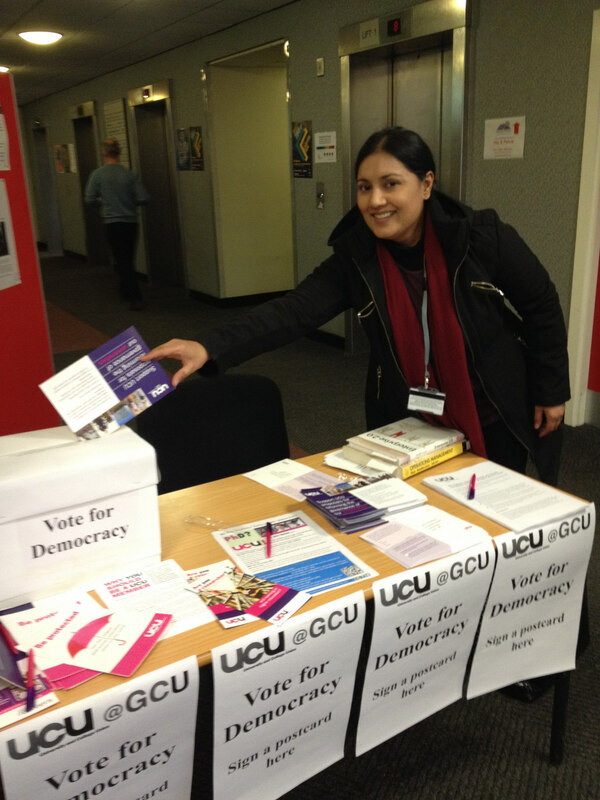 The UCU has drawn up a set of guidelines for staff which can be downloaded here. NUS has also produced some useful guidance here. The branch at GCU have produced our own broadsheet on the issue. 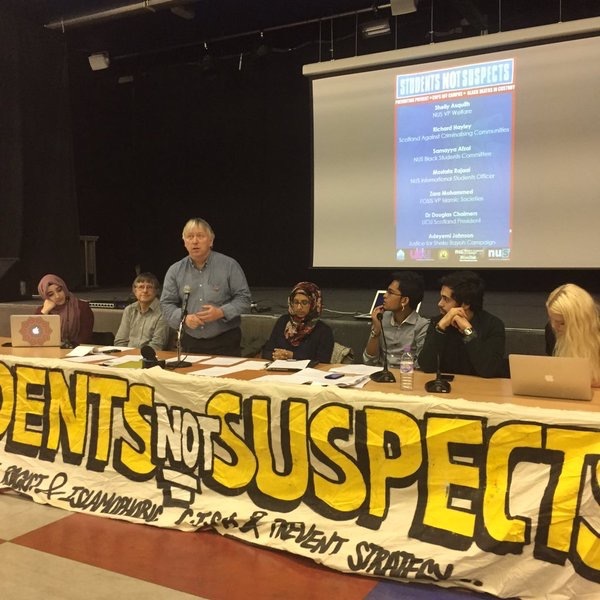 We will also continue to support the ‘students not suspects’ initiatives, and campaign to get the prevent measures scrapped. This entry was posted in UCU and tagged racism, Students, UCU on January 11, 2016 by unionadmin. A union network for postgraduates at Glasgow Caledonian has been launched, with an inaugural meeting on campus on Thursday 28th May. Organised by Ewan Kerr, UCU postgrad rep, the meeting discussed the general situation of postgrads in the different Schools of the university and the issues the union needed to take up on their behalf. Amongst the topics discussed were teaching expectations, (lack of) adequate teacher training, pay rates, and communication within the grad school. Douglas Chalmers, local branch president, Lena Wanggren UCU postgrad organiser from Edinburgh university, and Catriona Mowat, local VP, and organiser of the recently launched GCU women’s Facebook page for the branch also took part in the discussion. 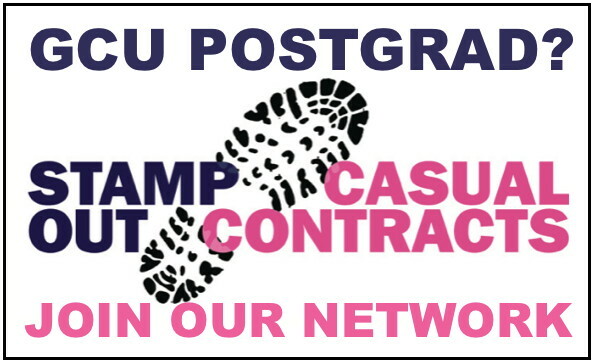 A facegroup page for UCU postgrads has just been launched which members are encouraged to join – search out GCU UCU Postgrad Community on FB. This entry was posted in Postgrad, UCU and tagged postgrad on June 2, 2015 by unionadmin. 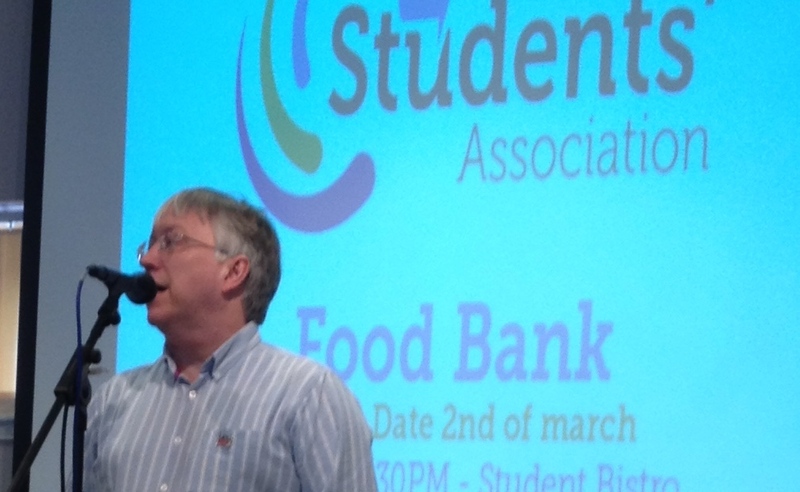 Local UCU branch president Douglas Chalmers, brought the greetings of the union to the local launch of the GCU students association food bank on 2nd March. Earlier the event had heard a moving speech from Denis Curran one of the coordinators of the loaves and fishes food bank, which amongst other things provides a sit down meal for forty people twice a week in a Glasgow church. Talking of young people who go to sleep hungry, wake up hungry and go to school hungry, Denis pointed out that for some of them the horizon of a university is subordinate to just managing to get by in their families. 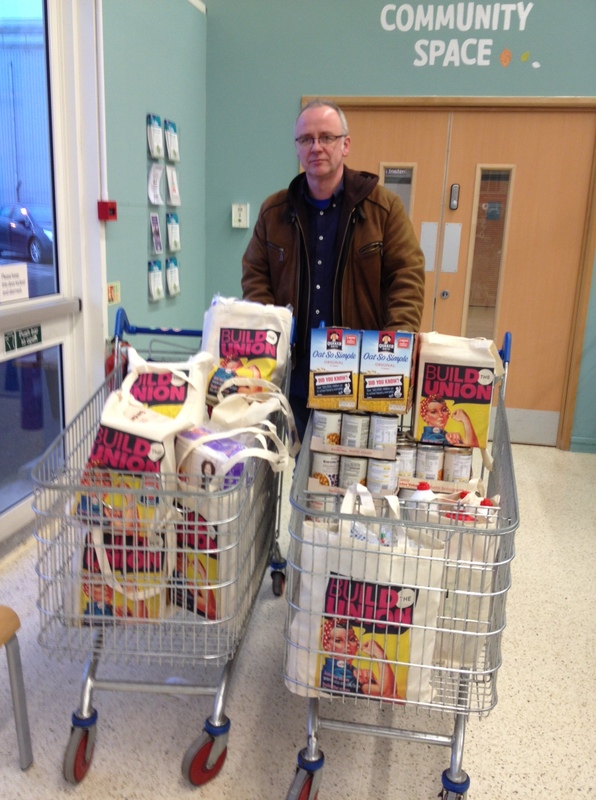 The UCU had donated 50 bags of groceries and toiletries to the event, and Douglas talked of how the UCU branch saw work like this as part of their activity within a wider university community of staff and students, where the university meant more than just a business model. Already the branch had cooperated with the Students Association on a register to vote initiative earlier in the year, and Douglas confirmed they were open to further suggestions for practical work together in the future. This entry was posted in Uncategorized on March 2, 2015 by unionadmin. Supporting the GCU students association initiative of setting up a food bank collection, UCU@GCU has donated 50 bags of groceries – over 300 items, to represent 1 item per member at the university. They are also appealing to their members to collect and donate to the food bank which accepts donations in the Students Association. Although we agree with the assertion made at this weekend’s conference that food banks are not the solution to a deeper seated crisis, we believe that anything that can alleviate the difficult situation that students find themselves in, the better. This entry was posted in NUS, UCU and tagged Students, UCU on February 28, 2015 by unionadmin. 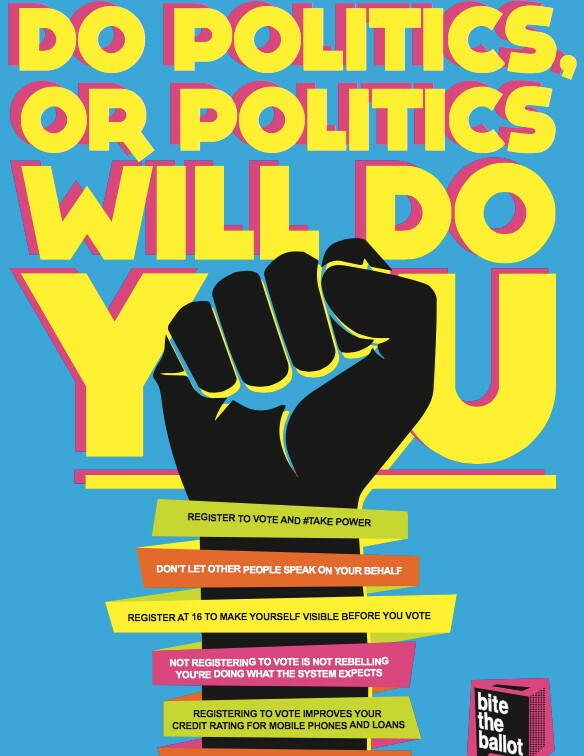 National Voter Registration Day, 5th of February saw posters put up in 100 classrooms and lecture halls at GCU giving advice to students on how to safeguard their right to vote. 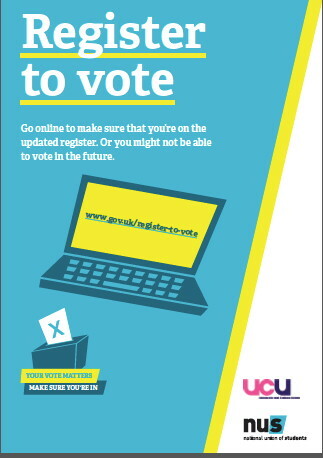 In a joint campaign run between UCU and the National Union of Students, 1000 students at GCU were also given a specially printed leaflet letting them know how to check whether they were on the updated electoral register, following changes imposed by the UK government which had led to 1 million UK citizens being removed. “Many issues are going to be decided at the next election which will have a crucial effect on students at GCU”, said Douglas Chalmers, local branch president. “International students are already hit badly by the restrictive policies of the border agency and there are many other issues still decided in Westminster that impact on young people here. The following election at Holyrood, will of course have immediate impact on education policy so it’s important that young people are not disenfranchised by measures to restrict those who can vote. The unions at GCU will work with the Students Association and the wider ‘Bite the Ballot’ campaign to ensure that this message gets through to as many people as possible”. This entry was posted in UCU and tagged Students, UCU on February 5, 2015 by unionadmin. “Expanding academic freedom in universities is is something that everyone connected to education in Scotland should be in support of” said Douglas Chalmers, local president of UCU at Glasgow Caledonian, following the branch’s submission to the current government consultation on higher education governance. The submission can be downloaded here. “Our submission also calls for the direct election of chairs of Court by students and staff, and for the investigation of the possibility and practicalities of additional elections within universities of senior management from positions of Head of Departments and above. “We have also repeated our view that there need to be specified places for students and staff on governing bodies and agree with the proposal that there should be positions for nominated representatives of trades unions. Given that trade unions are recognised as the representatives of staff in universities, we do not see the need for additional non-union ‘staff’ members on the governing body. “We would also be in favour of a majority of Senate members being elected and that efforts should be made to make the Senate more representative of diversity amongst staff. We are in favour of moving towards 50:50 gender balance on the Senate”. This entry was posted in Management, UCU and tagged academic freedom, Douglas Chalmers, Governance, UCU on February 2, 2015 by unionadmin.